For the last few years I’ve made it a personal goal of mine to try every beauty product on the market. I understand I’ll never come close to actually trying everything, but it’s fun to explore the market try new things. Thankfully being an influencer has allowed me to try a lot of the best brands on the market since companies want me to test and review their products. Hello dream job! My husband had an old professor who was very well versed in wine and explained how the price of the wine really doesn’t have anything to do with how good the wine actually tastes. You can have the best damn wine you ever tasted at a $9 price tag, but pass on a second glass from a bottle that was $250. I’ve come to believe that, to an extent, the same thing applies to cosmetics and skincare. Now don’t get me wrong, there are a few things that I am willing to pay top dollar for because they are good good products. But, I also think that there are a few drug store brands that are just as good as the pricy stuff, at a fraction of the price. With that in mind, lets check out my list. Every. Damn. Day. EVERYDAMNDAY someone asks me about my eyelashes and what mascara I use. I guess you could say my lashes are maybe a little long, but they’re nothing extraordinary, I swear. I’m just kind of good at putting on mascara, this one to be exact. I’ve tried almost everything at Sephora, and a few have come close, maybe even tied it, but at $8 I’ll always pick this one. $8 - find it here. Moisturizer is a very personal choice. I understand whole heartedly that different people have different needs. Some need oil, some (like me) need to be as far away from oil as possible. Some need thick heavy moisture and some just a little love to keep that healthy glow up. I used to get greasy from everything, no matter what it was. I stopped using moisturizer completely to try and fix the problem, but that wasn’t the right solution either. because then my skin created more oil trying to make up for the lack of moisture. 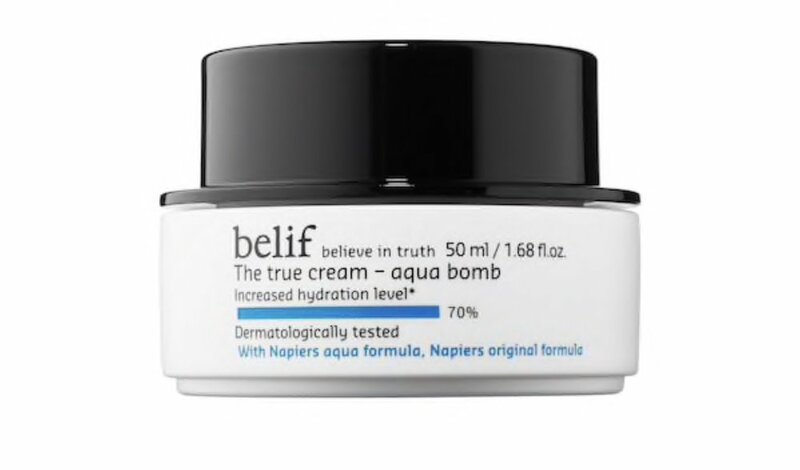 I first tried Aqua bomb as a sample from Sephora with my insider points ( how amazing is that program?!) and couldn’t believe how well it worked for me. All moisture and NO grease! Even Spencer threw out his old moisturizer and is now using mine. $45 - find it here. Fun fact: I had extensions for a really long time. Not-so-fun fact: They ripped all of my hair out. Its a catch 22 because you see it pulling your hair out and then you’re embarrassed of your thinning hair so you keep using the extensions so your hair just gets thinner and thinner. By the time I finally threw in the towel and took them out for good, my hair was so thin you could see my scalp through it. It was horrible. I used a variety of shampoos trying to nurse my hair back to good health, and finally landed on this duo. It worked wonders and even though my hair is super healthy now (and the longest its ever been without extensions!) I’m still using these two 6 years later! $9 each. Find it here. I believe one of the most essential cosmetics you can use is a really, really good primer. Foundation is important yes, but what you put under it is key. You can find primers to cater to all different skin types, color correcting, pore minimizing, etc. As I mentioned before, I always feel a little oily in my face. Because of that I feel like my foundation separates a little leaving me with little cracks and lines. After trying a fair share of high end photo finish, line perfecting blah bah blah, I finally stumbled across Blur Stick. I was having a conversation with one of the employees in Sephora about the one I was currently using, when she said “hold up girl, I got you,” and brought me this baby. I love her. Not greasy. Fill in all the lines. Foundation sits perfectly on top of it. And I don’t even have to rub it in with my hands, because it just rolls on. Amazing. $40 - find it here. You know how amazing dry shampoo is? (Don’t worry I have one on this list!) Well this is dry CONDITIONER! I love day old hair. And two day old hair. All that leftover product and texture creates the perfect organic wave or fluffy bun. The only problem is those dry ends. Mine fluff out in a second and even though the rest of my hair looks great with the added texture I don’t want my dry ends creating the dreaded hair triangle. Enter dry conditioner. It sprays on like dry shampoo but adds subtle non-greasy moisture to tame down those flyaways or sooth down the ends. Mind = blown. $23 - find it here. Next to my mascara, I get complimented most on my lip color. I love love love this cream stain from Sephora Collection. I love lipsticks. It’s one those things you can change daily to fit you look and mood. Having hair around my face and a baby who is constantly touching my lips (its a phase right?) I can’t really use anything that smears easily. This stain does exactly what it promises, it stains. Once you put it on it soaks in and colors for hooooours without having to worry about smudge. $19 - find it here. Who doesn’t love sheet masks? If you say you don’t, I don’t believe you. They all target different skin types and needs, and I use a variety of them as needed. My current favorite is this bubblesheet by Glamglow. It’s such a good, deep clean. I try to do it once ever 1-2 weeks to really get deep in those pores and pull all the makeup, sweat and dirt out. Maybe its in my head but I can actually see a change in my skin from before I put it on, to after its finished. Plus its just plain fun to watch the bubbles go crazy. $10 - find it here. $52 - find it here. Who loves washing their hair? HAHA nobody, I know. Dry shampoo is literally the best thing ever., however some brands of it, are the worst thing ever. Some of them smell like pure alcohol, or leave streaks of white residue. The point of using dry shampoo is so that people don’t know you were too lazy to wash your hair, so why leave telltale white streaks if they’re going to see them and know anyway?! The first dry shampoo I tried smelled so bad that I would have to use it on the patio, no joke. I couldn’t spray it in the bathroom because I couldn’t breathe. I didn’t know any better and thought they were all like that. Well they’re not. Ive tried at least 3 different ones from this line and they’re all been a success. Pro-tip: Going on a trip? This ones available in trial size! $4 - find it here. Have you ever finished a chapstick and felt really proud? I have. I lose chapstick on the daily. Or it melts in the car (tragic,) or your husband or kids steal it from you, or you buy a new flavor because you’re bored and the new one is shiny. This is the only chapstick I have ever finished. More then once. I don’t let it out of my sight and use it constantly. Ive never had a better one. I have a nightstand one, a car one, a purse one and a work one. Yes I know I usually have my purse at work, its just a precaution to have an extra on hand. While my favorite is the Milk & Honey flavor, all their flavors are gold. $5 - find it here. I have severely dry skin. Ezcema to be exact. If you’re not familiar with eczema its painfully dry, cracked and sometimes rashy skin. Most lotions don’t help at all, and actually hurt. Putting cheap lotion on skin thats already inflamed makes it feel like its burning. Yes, I said burning. On top of that, most lotions that are marketed towards eczema prone (or extra dry) skin cost double the price and do next to nothing. This hand cream from Origins is the best I’ve used on my hands next to straight vaseline. Its thick but not greasy, fragranced but not stinky, and best of it, it doesn’t hurt. It comes at a steep price tag for a small 2.5oz tube, but you don’t need much, giving it a long life. $28 - find it here.